Several finishes or nearly finished this week! The Kaleidoscope Quilt-Along is nearly finished. I have one border cut, and I'm going to add a second border of the red holly berries. 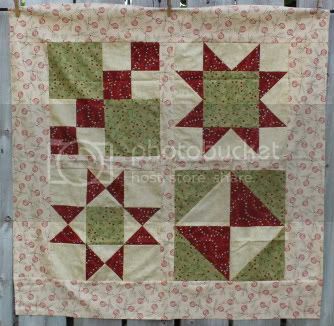 I made the blocks for this in my quilting basics class two years ago, and just needed to fix the borders and iron the poor thing. Not that hard to do as leaders/enders for a day. 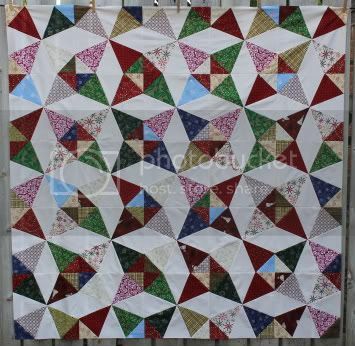 Haven't made any progress on Christmas Stars - my LQS's fat quarter sale is tomorrow, so I will either find something there or order the sashing tomorrow. And I haven't had a chance to sketch out any embroidery on the table runner I made last week, but I did get a book on embroidery techniques from the library. I'm not in a hurry - I have a long car ride in August to stitch. One more week to clear off my Christmas project shelf!